You can take a bus to Terminal A / Stathmos Kiffisos in Athens and from there another bus to Nafplio. Bus number X93 runs from just outside El. Venizelos airport's arrival hall to Stathmos Kiffisos. Buy tickets at the airport before entering. The trip lasts somewhere between a half and one hour, depending on traffic. Price approx 5 Euros. If you’re already in Athens, bus No. 051 from the intersection Zinonos and Menandrou Streets, south of Omonia, will bring you to Stathmos Kiffisos. Taxi from the centre normally costs between 5 and 15 Euros, depending on where the taxi picks you up. Stathmos Kiffisos is a major bus terminal. Find the sign that says Nafplio / Argolida, and buy your tickets there. The buses go hourly on the half hour from morning to evening (some exceptions). The journey takes two to two hours and 20 min., going via Corinth / Isthmos and Argos. Nafplio is the terminus. Price approx. 13 Euros. Discount if buying return ticket tour. Please note that the bus from Nafplio to Athens stops at Eleonas metro station (blue line) before it continues to Stathmos Kiffisos. From Eleonas the metro will take you to the centre, then continue to the airport. This will usually be a faster solution than to travel by bus. Just make sure you get on the right train, not all of them run all the way to the airport. The metro takes ca 45 minutes to the airport, and departs twice every hour. You must buy a ticket in the machine at the station, preferably using coins (10 euros in 2016). The metro runs significantly more often to the center, and costs under 2 euros. The simplest - and cheapest - is to get the hotel you will stay in in Nafplio to pre-book a taxi for you, or contact greek-taxi.gr. A taxi trip costs approximately 150 euros, and lasts a bit over one and a half hour. It is possible to take the "Proastiakos" train from the airport to Corinth, but the train from Corinth to Nafplio is suspended at the time of writing. Yet, it will be cheaper to take a train to Corinth and taxi from there, than to use a taxi all the way from the airport. Ask the hotel you are staying in in Nafplio to book a taxi for you. If you rent a car at the airport, it's easy to find the way to Nafplio. From the airport you drive directly onto the motorway and follow the signs first to Elefsina, then Corinth, and finally the signs say Nafplio. The road is generally very good, except for a short distance between Corinth and Nafplio which is fairly narrow and winding. Calculate two hours if you keep the speed limit. And you do, don’t you! There is a ferry (3.5 hours) and express ferry (2 hours) from Piraeus to both Ermioni and Porto Heli, via the Saronic islands. From Ermioni and Porto Heli you can catch the bus to Nafplio. Timetables here. In the summers, Pegasus Cruises arranges boat trips from Tolo to the islands of Hydra and Spetses. It is ususally possible to travel only one way, but arrange in advance with them. 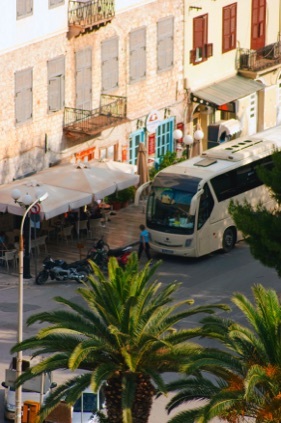 From Nafplio there are buses to various places in Argolis, check the KTEL page for details. But it is more or less necessary to rent a car / moped for a day or two if you want to visit some of the more remote sights / beaches. The main taxi rank is in Sigrou Street, by the bus station. If you want a car and driver to take you to the sites of Argolis, contact the local firm www.greek-taxi.gr. (…) the Peloponnese is easily the most beautiful corner of Europe. Buy a good map! Orama Editions has the best maps, a very detailed Argolis map and a great Peloponnese map. A good Nafplio map can be picked up for free at the Tourist Information. You’ll find it in the Town Hall on The Three Admirals’ Square / Trion Navachon. Many cafes, hotels, etc also have free town maps. Also check Nafplio on Google maps. The best guide book for Argolis and Peloponnese is Cadogans Guide to Peloponnese. Invaluable when you visit archeological sites! The bus station in Nafplio, in Sygrou Street. In this map, I have marked all the places in Argolis mentioned on visitnafplio.com. Click on a red arrow and find the page that the coresponding sight is described. You can also use the same map on Google maps , if you prefer. For sights outside Argolis, please use this map. Some European airports have direct flights to Kalamata. You'll need a taxi or a rental car to go to Nafplio, but the time spend is almost the same as travelling to Nafplio from Athens Airport.